The highest achievers on the TSA Surveying Course were commended for their diligence and professionalism by tutors and industry professionals at The Survey School’s annual graduation day ceremony. This year’s presentation took place at Worcester Racecourse and included an additional award to recognise the attainment of two outstanding students, separated by just 1 per cent in their results. 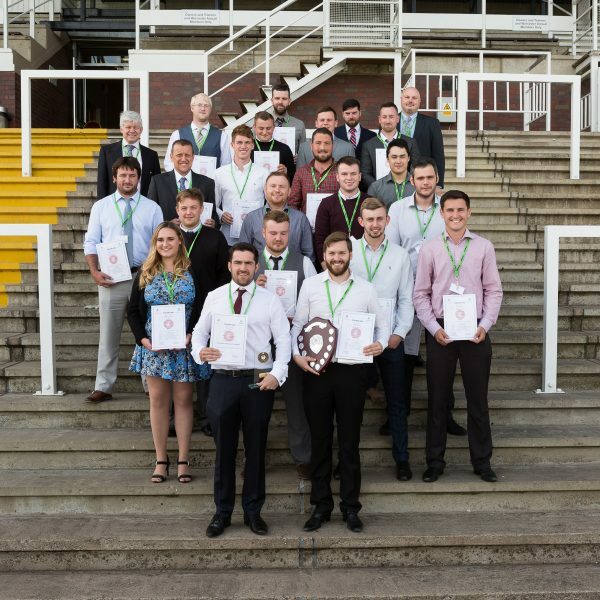 Jointly sponsored by The Survey Association (TSA) and Leica Geosystems, the award for Best Student went to David Brooks, formerly of Pegasus Group, who gained an overall mark of 92 per cent. Course tutor Andrew Crumpler said, “To win this award students are required to return not only high marks in all areas but to act in a professional and dedicated way throughout. David is able to put his learning into practice very effectively and will be a great asset to any organisation he works for”. David came to his studies from a GIS background but with no previous experience in field survey. On the day of the presentation he was honeymooning overseas but will collect his prize from TSA President Mark Combes and Leica Geosystems’ Managing Director John Fraser on his return. David Brooks commented on his achievement, “Studying at The Survey School has been a thoroughly worthwhile and interesting experience. In the time frame of the six blocks I have been able to obtain Associate Membership to RICS and accept a new and more challenging job. None of this would have been possible without the skills and knowledge I acquired during the TSA Surveying Course”. TSA Vice President, Adam Bradley named Luke Allen from EDI Surveys as the first recipient of the new Vice President’s Award. Luke gained an overall mark of 91 per cent and produced two assignments marked at A+ standard. His tutor was particularly impressed with Luke’s presentation and team proposal for an additional GNSS network to be used on a project, noting that it was “well argued with a good indication of the financial advantages in using the improved system”. Luke Allen said, “The Course tutors and the TSA have given me so much support and confidence in my ability on site. Putting the classroom theory into practice has been so helpful. Now I can see a clear progression in my career prospects. I was made up to trainee surveyor before starting the Course and have since been promoted to junior surveyor. I have my sights set on being made up to surveyor once I have a bit more experience”. Danny Bark of Jacobs UK was presented with the prize for Best Assignment by David Loosemore, President of the Chartered Institution of Civil Engineering Surveyors, (ICES). From left: Adam Bradley, Vice President of The Survey Association with Luke Allen of EDI Surveys, winner of the Vice President’s Award. The Survey Association was formed in 1979 and now has private survey company members in all areas of geomatics. TSA represents members on a wide variety of initiatives including the Survey Liaison Group, the GEO Business Show, Defra Flood Forum, BSI drafting panels, Survey4BIM and continual Government lobbying. TSA is governed by a Council of 12, elected from the Full Member companies. A full-time Secretariat, based in Newark-on-Trent, runs the operational side of the Association. The Survey School: In May 2014, TSA took over the running of the Survey School in Worcester. The TSA Surveying Course, written by TSA in 2001 to address the chronic shortage of survey raining in the UK, continues to go from strength to strength. TSA is committed to training the next generation of surveyors and is expanding the number of short courses available at the School. TSA has also offered a Student Bursary to students in their second year at Newcastle University since 2011.